Tencent, one of China’s biggest Internet portals, unveiled its Q+ desktop interface to officially launch the QQ Open Platform for native applications and those developed by third-party developers. Q+ will be accessible in the next release of Tencent’s QQ Instant Messenger, which lets applications access QQ’s 650 million active users. With a single click, users will be able to switch from their regular operating system to the Q+ interface, which functions much like a pseudo operating system of sorts. 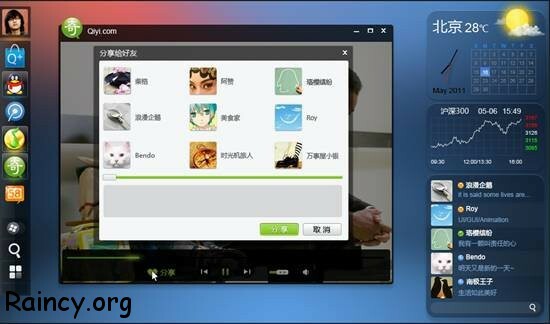 Q+ loads a dock on the desktop, which resembles the Mac OS Dock, with pre-installed applications for QQ services, including IM, music, video, and the social networks Qzone, Pengyou, and Weibo. Users will also be able to run third-party applications in the Q+ desktop interface. According to the report, Tencent will experiment with providing third-party developers with access to the Q+ API, which gives them access to various Q+ modules including content sharing, document upload, and voice and video chat. These third-party apps, as well as native QQ apps, will be available for download via the App Market application but the terms for revenue sharing terms have yet to be revealed.